Are you frustrated by the shortcomings of your current registration system? Do you want to manage in-seat and online courses in one place? Would you like to charge for courses and materials? Are getting all the benefits you could from your registration data? Are your reporting needs beyond your current system capabilities? Do you want to save more time and money? Well, consider adding GoSignMeUp! 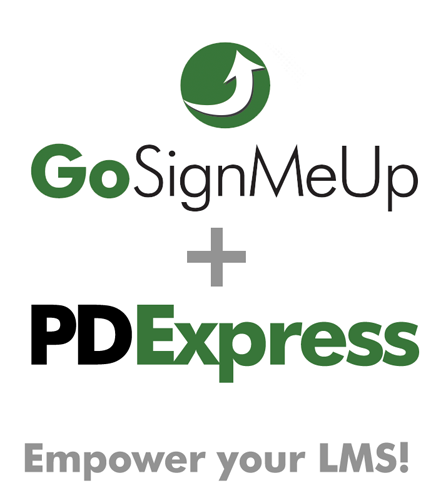 Add GoSignMeUp to your PD Express system and expand your capabilities! As an incentive we will throw in 6 months for free when you purchase an annual subscription. If your organization offers classes, workshops, events, trainings or conferences for which participants need to register in advance, GoSignMeUp’s online event registration software can make you a hero. Why? Because this online class registration system will save your organization countless hours of administrative time, create a “green” and paperless event registration process, reduce costs and be available to take sign-ups 24/7. Everything from confirmation and reminder emails to payment management, transcripts, rosters and name badges, PD Express integration and quite a bit more is all included – and automatically handled for you. To learn why GoSignMeUp’s class management software is head and shoulders above anything else available, schedule a free online demo today.